Hi friends! Today’s post is actually not about something new, but about a change. 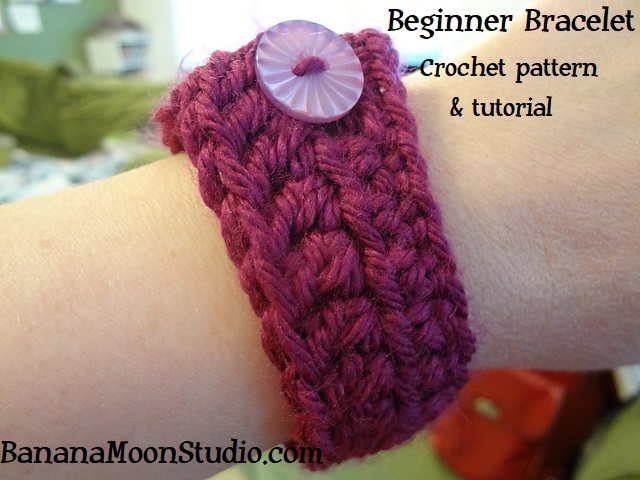 Years ago I designed this very simple cuff bracelet as a way to teach my students how to make the most basic crochet stitches, while still giving them the opportunity to make something usable and wearable. I think that people are more motivated to crochet, when they feel that they can make something they like right of the bat. I also hope that as they make this project, along with my video tutorial, they will learn how to read a pattern. This beginning crochet pattern is now available in print – for FREE! At first, I only gave the printed pattern to those who had paid to take my class. I also put together a tutorial video so that my students could get help remembering what to do even after the class was over. This was, if I remember right, the first video ever posted to my YouTube channel. The video has always been public, so anyone could watch it and get the pattern that way, just not in writing. Today I am happy to say that I am adding the free written pattern to my blog, and will have the tutorial video embedded here in this post. Many of my loyal readers have been crocheting for years, so you will probably think that this post does nothing for you. However, this post will be a great one to share with friends or family members that would like to learn how to crochet, so please share! Finished Measurements: Child size: about 1 1/2″ x 6 1/2″ [Adult size: 1 1/2″ x 8 1/4″]. Notions: 1 button about 3/4″ in diameter, tapestry needle. Guage: 12 sts = about 4″; 3 rows of bracelet pattern = about 1 1/2″. Row 1: Skip first ch, sc in each rem ch, turn – 20  sc. Row 2: Ch 2 (does not count as a st now and throughout), hdc in first 2 sc, ch 1, skip next sc, hdc in each rem sc, turn – 19  hdc. Row 3: Ch 2, dc in each hdc to ch sp, dc in ch sp, dc in last 2 hdc, turn – 20  dc. Fasten off. Sew button on end of bracelet, opposite buttonhole. Weave in ends. Get 2 FREE patterns when you sign up!